It’s interesting to see how if you look beyond the popular models from Chevrolet and Buick, as we did with yesterday’s Dodge, you can find some interesting, very well-preserved American classics for really short money. Apply the usual caveats about pictures hiding the truth you could find in a real inspection, especially on humid-state cars, but a little bit of looking around yields some really nice grandpa cars that would probably make great companions for an interstate drive from their home to yours. 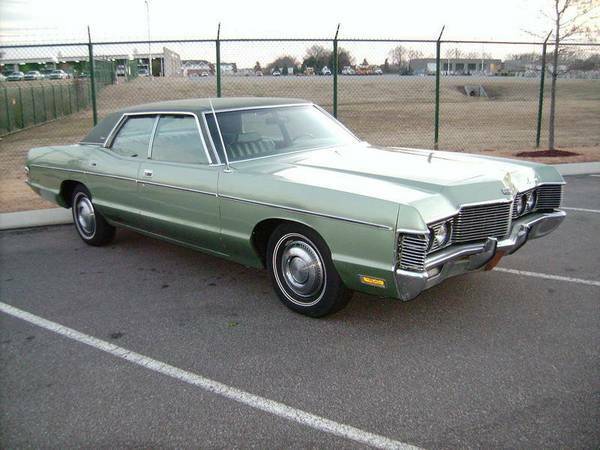 The first example of this is this 1972 Mercury Monterey for sale for $1999 (payable in 3 EASY monthly installments) in Atlanta, GA. 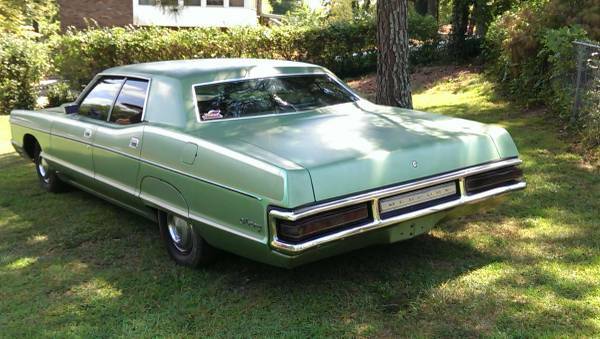 This light green metallic suits the understated lines of this early 1970s car just fine, and you can definitely see the family Lincoln Continental and Ford LTD genes in the car’s design. It’s amazing how well the Detroit manufacturers succeeded in minimizing the proportion of passenger compartment to actual body length on their large sedans. Significant revisions to the 1969 Monterey were made in 1971, including wider c-pillars, fender skirts, frameless windows, and pull-up door handles, so the only changes for 1972 were an egg-crate grill and a warning buzzer for the front seat belts. This particular car is said to have accumulated a mere 80,000 miles over 42 years, and the seller says the car has no accident or corrosion damage. The paint does look somewhat oxidized in most of the pictures, but it’s completely in line with the age of the car and serves to give the impression of a more appealing, honest car than if it had fresh, shiny paint. Superficially, the engine compartment with its 351 V8 looks to be in good shape and reasonably tidy. The car comes with tinted windows and a CD player. The car was equipped with power steering and air conditioning from the factory, though it’s not clear if the latter is still functioning. Just a quick recharge and you’ll be on your way, right? Too many doors on that Monterey for you? Or perhaps you were hoping for another 100 cubic inches of displacement? 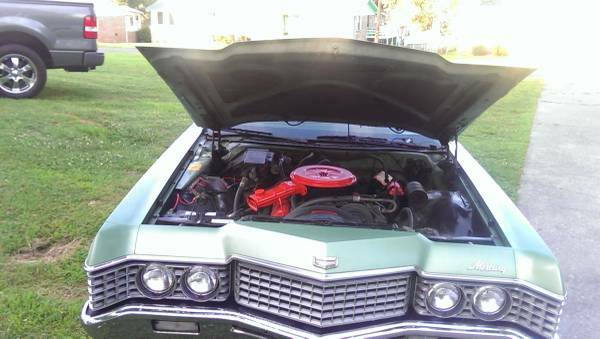 Well, look no further than this 1973 Buick Electra coupe for sale for $3200 in Kissimmee, FL. The pale blue color suits the car surprisingly well, and it looks to be in equally impressive shape for the price. 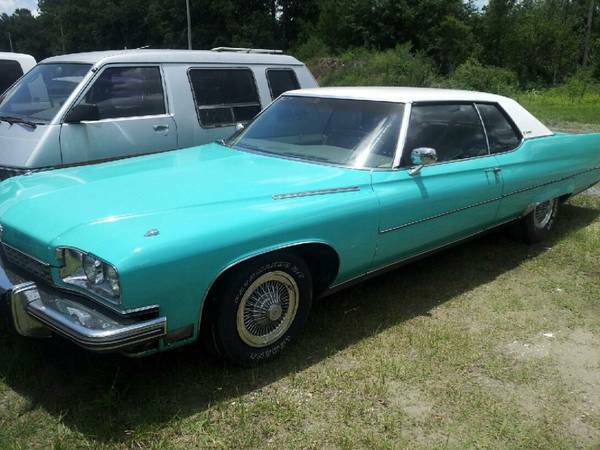 Save this car by buying it before someone paints it in kandy colors, jacks it up and adds 26″ wheels! This entry was posted on September 3, 2014 at 4:46 pm and is filed under Feature. You can follow any responses to this entry through the RSS 2.0 feed. You can leave a response, or trackback from your own site. I’m afraid the 26″ wheels are the inevitable fate of both of these poor behemoths; that, and eventual police impoundment and resale at the forfeiture auction.